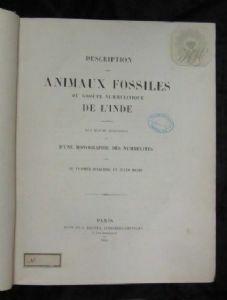 Description des animaux Fossiles de L'Inde by Le Vicomte D.Archiac et Jules Haime. 1853 Paris. Large format. Marbled end boards and red leather spine. This really is an exceptionally rare and unusual book. Published in French. It has some sort of 'Royal' stamp and a library stamp in Russian on the front cover ! 373 pages with 36 plates of fossils. Some rubbing on the corners. Contents in mint condition. I cannot find another copy of this book for sale anywhere in the World!! 33.5 x 26.5 x 4cm.